‘Planned obsolescence’ – the practice of companies deliberately manufacturing their products to have a shorter lifespan – is an increasingly serious issue. It isn’t just annoying to buyers; it contributes to increased consumption and waste, and the products ultimately sit in our landfills. Believing that sustainable travel starts with planning, Journeys With Meaning has partnered with Bragpacker, an online store that allows travellers to rent their gear. “With such products, it’s usually better to rent than buy, since it’s unlikely that we’d use this equipment daily,” says Vinod, Founder, Journeys With Meaning. The seeds for Bragpacker were planted when Manan Shah was traveling across South America. Backpacking with people from all over the world, he realized how over-packed, yet ill-equipped he was. Despite spending a lot of time and money on his pre-travel planning, he was nowhere near as comfortable as his European counterparts. “Globally, there has been an explosion of innovative products designed specially to enhance travel experience. Unfortunately, they remain inaccessible to most Indian travellers,” he says. The Indian traveller has come of age. The idea of seeing Europe in ten days no longer holds charm and a good itinerary is not measured by the number of landmark destinations covered in one day. We’ve come to value discovery and exploring over sight-seeing, and travel is now accessible not just to the wealthy few. Bragpacker offers all travel essentials including luggage, cameras, baby care, and more. Aggregating some of the best brands in the world, Bragpacker manages to keep prices low by offering rental options. “Today, the industry has invented itself to allow people to travel more. From budget airlines to hostels, an entire culture of backpacking has risen to help everyone write their own travel story. It was only natural that this culture had to be supplemented with the right equipment too,” Manan says. Is there hesitation around renting pre-owned gear? Definitely. The first time round, most travellers are wary of renting their gear. 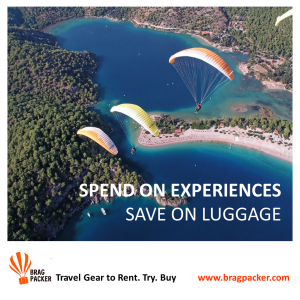 But thanks to Bragpacker’s widespread word-of-mouth reputation, combined with the value they offer – rent premium travel gear at less than 1% of the cost – buyers usually decide to give it a shot. Around the world, travel gear has attained a level of sophistication that’s impossible for us to reach right away. The Indian travel equipment market will easily take a decade to catch up with our foreign counterparts, according to Manan. In the meantime, Bragpacker delights travellers with the best of local and international equipment. The platform also sells products, and gives buyers an option to ‘try and buy’. This option is one of Bragpacker’s most popular, second only to its rental services. Bragpacker fits into the core of what Journeys With Meaning does, making them the perfect partner. “Implementing doable, long-term solutions doesn’t have to be a complicated task and with Bragpacker, Manan proves just that,” says Vinod.